Joan Crawford - "Dr. Emily Brockton"
Bernard Kay - "Inspector Greenham"
Kim Braden - "Anne Brockton"
David Griffin - "Malcolm Travers"
Thorley Walters - "The Minister"
Jack May - "Dr. Selbourne"
When three explorers find the "missing link" in an English cave, local anthropologist, Dr. Brockton(Crawford), attempts to study it while battling the local township, whom want to have the creature destroyed. ​ Producer Herman Cohen purchased the original story written by Peter Bryan and John Giling in 1968, with filming scheduled to commence in November 1968 with a $2,500,000.00 budget. Production delays prevented the filming until June 1969. Filming began on July 7th, 1969 in London, England. ​​Principal photography ended September 8th, 1969. ​​September 30th, 1970: Released nationally as a Double-Feature with the film "Taste The Blood Of Dracula". $44,000.00 (First week, September 23rd, 1970) Chicago, Illinois. $22,000.00 (Second week, September 30th, 1970) Chicago, Illinois​​​. $17,300.00 (First week, September 30th, 1970) Warfield Theater, Spruce Drive-in - San Francisco, California​​. $25,000.00 (2-day, Second week, October 14th, 1970) Multiple theaters - Columbus, Ohio. "Three hours of British-made pseudo science fiction and horror, such as "Trog" and "Taste the Blood of Dracula" that drenched the screens of the DeMille and other houses yesterday in ersatz plots and gore, could conceivably encourage potential movie buffs to turn, say, to the charms of plumbing. This might not be a disservice since neither entry shocks entertainingly nor enlivens the ailing cause of the B-type thriller on the lower half of double bills. 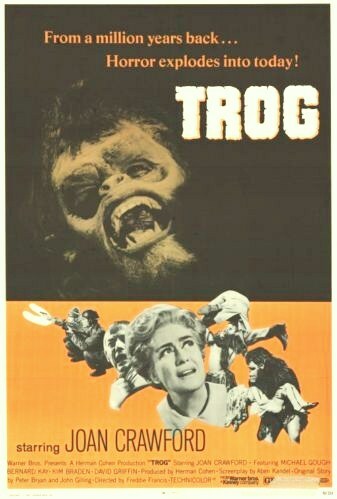 There is, however, a rudimentary virtue in "Trog," a sort of second cousin, 15 years removed from "Creature From the Black Lagoon," in that it proves that Joan Crawford is grimly working at her craft. Unfortunately, the determined lady, who is fetching in a variety of chic pants suits and dresses, has little else going for her. As the anthropologist chief of a research center that has unearthed a living, hairy, half-caveman half-ape, Ice Age "missing link," a troglodyte she cutely nicknames 'Trog' and attempts to rear as you would a backward child, she poses no threat either to Dr. Margaret Mead or Dr. Spock. Of course, there"s the villainous Michael Gough who goads the gentled 'Trog' 'into murdering several villagers, a rampage that leads to "Trog's' climactic destruction. "I never expected this," one of Trog's discoverers exclaims. But thanks to a script that makes everything vapidly obvious from the start, 'Trog' is no more exciting or scientific than the antics of a rambunctious kid in a progressive school. If anything, "Taste the Blood of Dracula" is as "scientific" and humorless as "Trog." Christopher Lee, as Dracula and an old hand in the horror trade ("The Hands of Orlac," "The Gorgon," "Dr. Fu Manchu," "Dracula," "Dracula Has Risen From the Grave") now is involved in dispatching three improper Victorians, who not only are averse to drinking his blood but also have killed one of his disciples. As the vampirish Count, complete with crimson eyes and king-sized incisors, Mr. Lee, his victims, Geoffrey Keen, John Carson and Peter Sallis, and their amorous sons and daughters, Linda Hayden, Martin Jarvis, Isla Blair and Anthony Corlan, succeed in making blood-letting an anemic show. Early in the creepy proceedings in a ruined church, one of the timorous trio whispers, "My God, I don't like this." He proves to be absolutely right.​"